Plenty of people have written up about the subway, both online, in magazines, newspapers and as books. Wiki has this introduction to the subway,whilst London Reconnections has this more comprehensive write-up plus a look at the Crossrail works within the tram subway. 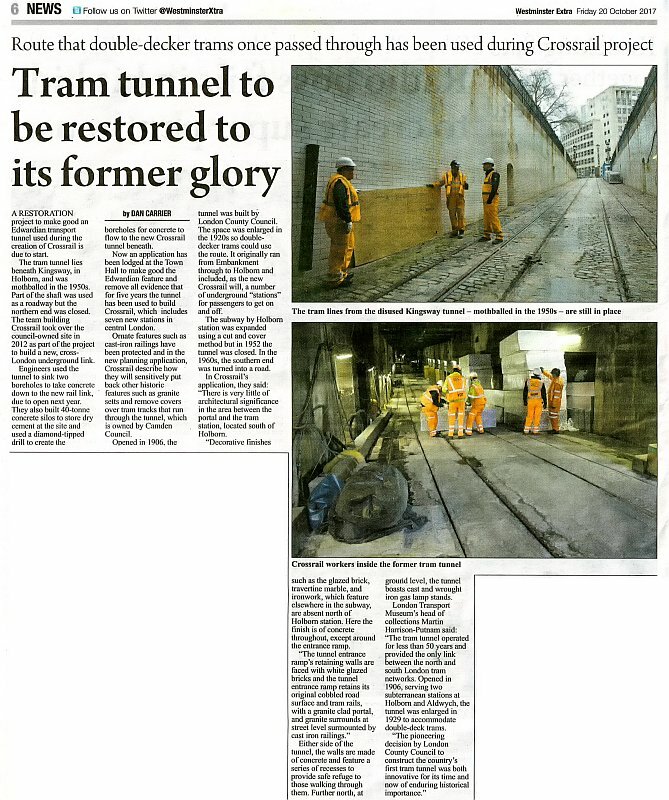 With the completion of Crossrail, the subway is now being handed back to the council and this is the reason for the news article. Much of the work for Crossrail took place at the northern end of the subway. This involved the digging of a shaft along with another dug in adjacent Fisher Street to facilitate the construction of the Crossrail tunnels. The entrance in Southampton Row has been a Crossrail works access point for several years. A view looking towards the subway’s 1931 built portal. The rear of the structure, showing the substantial pavement built to cover the strengthening beams needed to roof the tunnel & enable enlargement for double deck trams in 1930/31. The northern steps down to the tram station now covered by this metal grille. The station at Holborn can still be seen both from within the tunnel itself and partially from street level. if one peers through the grilles in the middle of the road the station steps and notices can be seen. The station at Aldwych no longer exists. It was right opposite Bush House, just before the tunnel took a sharp turn right into Aldwych itself. The route is now part of the Strand underpass, opened in 1964. Aldwych. The tram subway’s below the road and now constitutes part of the Strand underpass. One can still use public transport through the southern half of the former tunnel. At peak hours Red Arrow bus route 521 takes a shortcut through the subway to avoid traffic jams in Aldwych. You Tube has this example on video showing the route and a bit of history about the tram subway. One Embankment, underneath the arches of Waterloo Bridge. This nightclub is the former southern entrance to the Kingsway subway. Its website mentions the tram subway.